In the summer of 2017 Winsor Music began our partnership with Beth Israel Hospital. 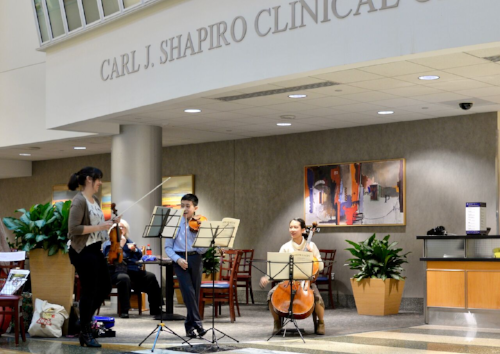 We play chamber music for patients, doctors, nurses, and staff in the beautiful lobby of the Shapiro building once a month. It has been so wonderful to see how patients and staff enjoy the music resonating through the lobby. Some people stop for a few minutes, others stay and listen for the whole hour, and some patients even schedule their appointments around our visits. Co-Artistic Director, Gabby Diaz, was diagnosed with cancer as a teenager and speaks about it here: "Music played a vital role in my treatment and recovery. Music was always there to lift my spirits and help me understand the complex emotions I was feeling during that difficult time. I decided back then that I would do my best to give this feeling to others going through treatment. I knew that music could be helpful to others, no matter their experience with classical music. It is so exciting that Winsor is able to bring music to everyone coming through the Shapiro building, and we look forward to expanding this project in the future. "